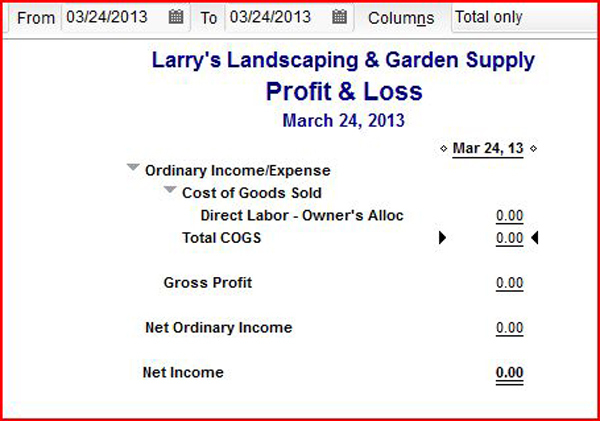 How to track Job Time Costs for LLC members/owners that are not Employees? They are not on the payroll so they cannot enter time worked to jobs. But it is important to see how profitable the jobs are. The idea here is to create a Zero-Journal bill to allocate time and effort to jobs without impacting on P&L report. Zero Journal (under Accounts Payable – this is to differentiate this from operational Accounts Payable). Refer to Image # 1 for setup screen. Direct Labor – Owner’s Allocation (under COGS). Refer to Image # 2 for setup screen. Refer to Image # 3 for setup screen. The net impact is zero journal entry with no impact to Profit & Loss account. Now, let’s look at the various reports what will they turn out. The big test is to see how it will come out in the Profit and Loss Report. See Image # 9 below. It shows no impact to P&L, and it zeroes out. It worked! Please note that you should always run this past your CPA or Tax advisor to confirm it meets your needs, as we are not financial experts.